Fall rates increase as we age and the injuries ger more severe as well. “Falling and fighting top the list of major causes of eye injuries resulting in hospitalization over a 10-year period, says a new study. 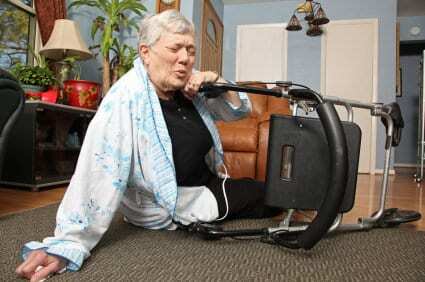 Falling was the leading cause, usually involved seniors age 60 or older, which were the most costly to treat. The research was presented last weekend at AAO 2015, the 119th Annual Meeting of the American Academy of Ophthalmology. Falling was the No. 1 cause of eye injuries overall and accounted for more than 8,425 hospitalizations. Researchers also found that the cost to treat eye injuries at hospitals rose by 62 percent during that period and now exceeds $20,000 per injury. Serious ocular trauma injuries include orbital fractures and being pierced by objects. These injuries can be expensive to treat, and in many cases are preventable. With that in mind, researchers at Johns Hopkins University decided to identify the most common causes of eye injuries as well as the associated hospital costs so that prevention efforts could be better targeted. Such interventions could perhaps lower eye injury rates and overall health care costs for eye trauma inpatient visits.